The highlight of the reverse side of the coin is an American eagle clutching an olive branch (to symbolize peace). Originally the eagle was perching on a broken sword, but the sword proved to be very controversial and was removed from the final design. “UNITED STATES OF AMERICA” and the motto “E PLURIBUS UNUM” stretch across the top of the eagle. 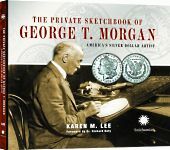 The words “ONE” and “DOLLAR” appear on either side of the eagle. Diagonal upward-slanting rays appear in the background behind the eagle, suggesting both sunlight and Lady Liberty’s crown from the obverse side. 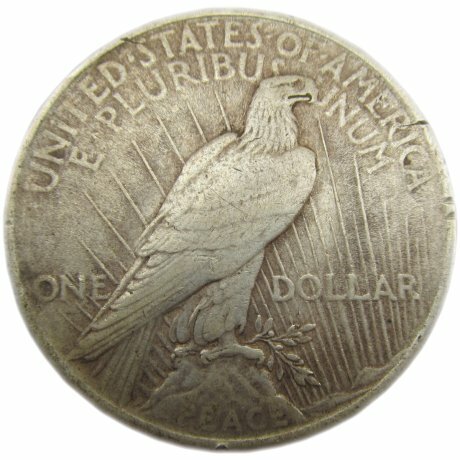 Even though this coin is known as the Peace Dollar, the word “PEACE” appears on it only once, at the bottom of the reverse side, in smaller print than any other words on the coin. Filed under Coins Reverse, Peace Dollar.